Green Flash Brewery is one of the newest breweries to enter Indiana (beginning in July of 2013) and hails from my hometown of San Diego. I'm excited to see a brewery from one of the beer meccas of the world enter the state, and I'm surprised that more San Diego breweries haven't landed here just because of the sheer number of them that exist (~80 and that number pushes to over 100 if you count the ones "in-planning"). Currently, only Stone, Green Flash, Mission, and Lightning (very limited distribution) are around these parts, but there are others that are distributed to surrounding states (e. g. Alesmith and Ballast Point). It's not surprising that Green Flash came to Indiana considering how much they've expanded (distribution in 48 states now) and they're also one of a handful of breweries that are planning on becoming "multi-regional" with a planned 2nd facility in Virginia Beach, Virginia. Green Flash is probably best known for their West Coast IPA. In general their beers are assertively hoppy; and the beer featured in today's review is a prime example of that. Originally brewed for Hamilton's Tavern (a San Diego craft beer landmark) 2nd anniversary, Palate Wrecker is a double IPA that packs in 6 pounds of hops per barrel- I don't know how other IPAs compare, but that sounds like a lot to me. 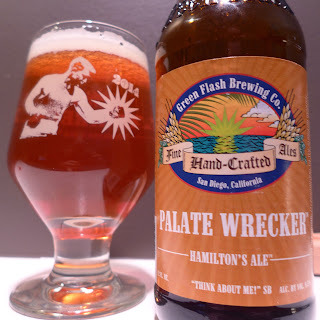 Within the last couple years Green Flash made Palate Wrecker a regular offering and has plugged it into their new seasonal rotation with the recently released Green Bullet (Sep. - Dec.) and the yet-to-be-released Road Warrior (May - Aug.); Palate Wrecker fills the Jan. - Apr. slot, but watch your bottle dates as April rolls around. Review time! Palate Wrecker pours a deep copper with a nice 1-finger beige head; it leaves decent lacing on the glass as I work towards the bottom. The aroma is strong pine, apricot, mango, and citrus. On the tongue all these things are present (along with resin), but the citrus becomes more defined with grapefruit pith and lemon. The malts aren't too present in the aroma, but in the taste there are notes of biscuits and caramel. Lastly there's a good dose of booziness, which is somewhat surprising considering this "only" clocks in at 9.5% ABV. 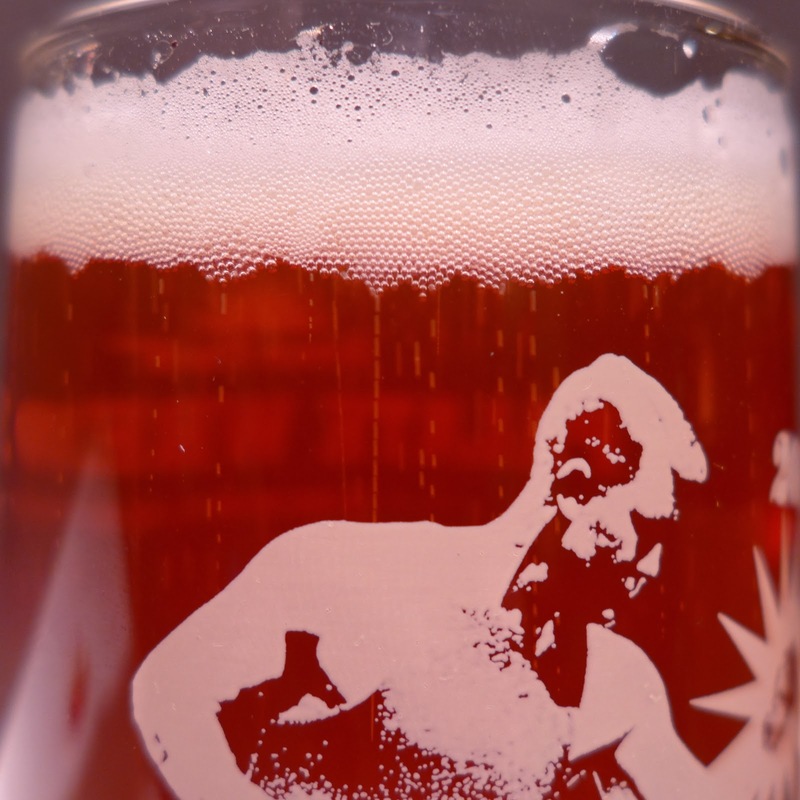 The mouthfeel is medium to heavy, with soft carbonation, and a slow drying finish that also warms a bit. The Big Guy: I agree with the Brewnibomber. I've only had the Green Flash beers that we've been able to get here in Indy since their release last year. That being said, I was a big fan of Green Bullet, their last seasonal DIPA, so I had great expectations for this one. I've heard a lot of hype about it in the past from friends who've tried it and confirmed that it truly lives up to its name. After drinking a couple, I can attest to the fact that it does. It was one of the most agressively hopped IPAs I've ever had. 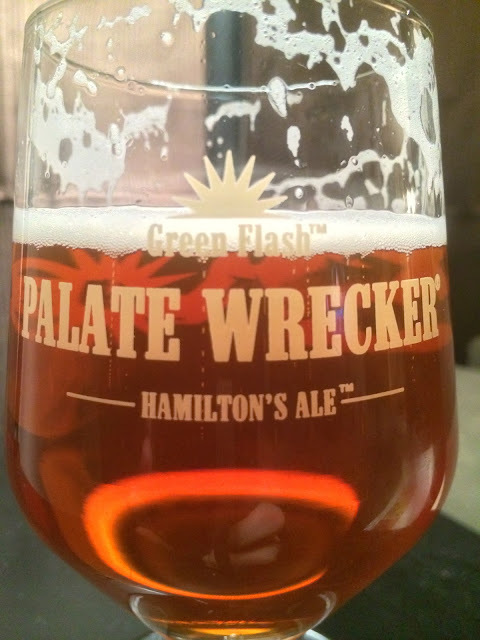 I know when you call an IPA "Palate Wrecker", I probably shouldn't be talking about balance, but that was my big problem here. It reminded me of RuinTen by Stone, but I felt it lacked the complexity of flavor to carry that big angry hop bomb. It was a good beer, and an interesting experience, but I'm glad I only got 1 four-pack. I give it a 3.5 for daring.